Same traditional vows being repeated at every single wedding have made things a lot more common. The couple may feel the rush of love when exchanging vows, but for the audience, every wedding is the same. LGBT couples have the leverage of having no such traditions set already. They both have a chance to make things work out on their own and most importantly they can do it the way they want it. LGBT wedding ceremonies are always a ground where you can experiment with new things and make them part of the legacy. 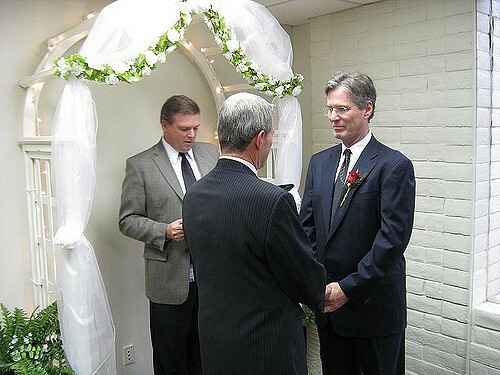 If you are looking forward to drafting your vows on your own and don’t want the wedding officiant in Oklahoma City to use the same vows they used in the previous LGBT wedding. Wanting something romantic or more of straight to the point, any essence you want to make your vows to express, you can take inspirations from movies, traditional vows or something impressive you heard over in the last wedding you attended. You can even google some amazing vows, however, if you make it your own way then you will feel associated with every word you utter on the day! You can even take reference and ideas from wedding officiant in Oklahoma. Find anyone and ask for their ideas, this will help you brainstorm what exactly you want to say on the big day. You can explain to them what you want and the exchanging of ideas will give you a good deal of information. To come up with flawless vows, you need to be very precise about what you want it to be. Rewriting the draft, again and again, to make it more fine and beautiful. Try saying your vows out loud to know if they sound perfect and the way you wanted it to. Your words should show the determination you both put in towards making the wedding happen. Hope you find it easy to put your feelings in words and make your partner astonished while exchanging vows on the big day.